Why HP Workstations Are Better Than Desktop PC? If you're in the business of creating stunning 3D graphics, designing intricate parts and assemblies, or analyzing crazy amounts of data in real-time, or if running several graphics and compute intensive applications at once is just another day in the office, no less than an HP Workstation is what you need to keep your business going like a well-aided machine! Forget about lag-time, now you can cut-down turnaround time, and take an even more complex tasks - and whatever else your industry demands of you today. Greater performance and reliability. HP Workstation are powered with server-class processors with much more stable lifecycles and higher reliability. What's more, mid- and high-end workstations are fully expandable to up to twelve processor cores with support of two processor sockets. Extensive testing and certification. All HP Workstations are subjected to rigorous and exhaustive ISV testing and certification which means getting the most reliable hardware, drivers and software. Powerful graphics. Built for professional demanding the best tools, HP Workstations offer superior graphics capabilities ideal for specific tehcnical applications and market segments. 64-bit edge. Run multiple applications and larger files all at the same time without getting slowed down with Interl's Extended Memory 64-bit technology. Freedom of choice. Choose from a wide range of processor and graphics options; with Microsoft or Linux operating systems. Built-in software security measures and external hardware locking devices. Intel Xeon processors with a choice of more cores, greater memory bandwidth, larger cache and higher frequencies. From integrated graphics to multiple 2D and 3D solutions. ECC Memory and storage options that use server-class technology and are rigorously tested for 24x7 operation. To help ensure out-of-the-box compatibility between HP Workstation and professional applications. Up to 512GB of memory and 14TB of storage. Workstations are designed to meet the unyielding demands of today’s professional and technical workplaces. If you work with large and complex datasets or intricate 3D models, HP workstations can deliver the performance you need. If you run mission-critical applications, HP Workstations give you uncompromised reliability. 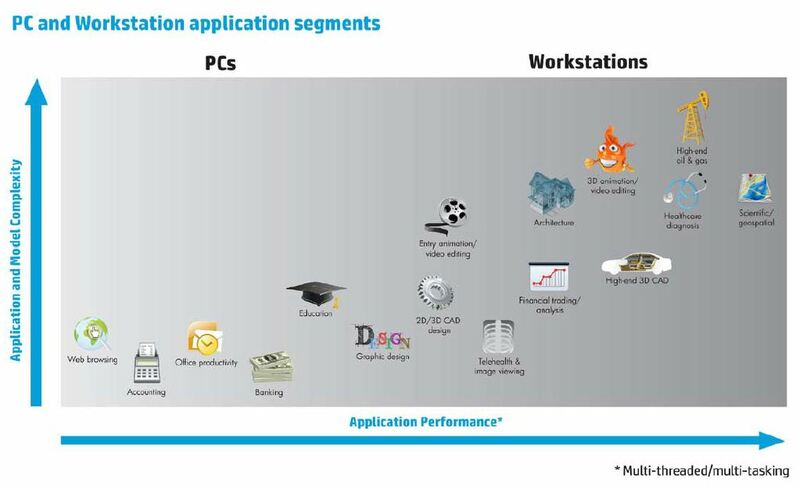 Or if you need room to grow, HP Workstations have wide-ranging scalability choices. Our intense focus on innovation, performance and reliability has kept HP at the forefront of the workstation industry for 30 years.